Black is the color (or absence of color, rather) of choice for these twelve homes from San Francisco to Berlin to Tokyo and beyond. 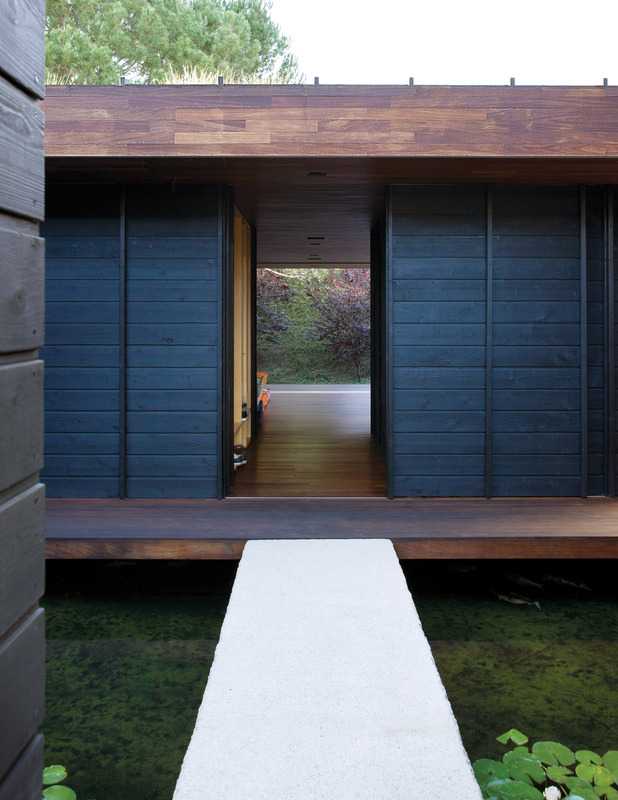 The Sebastian Mariscal–designed Wabi House in Carlsbad, California featured a charred-cedar facade. From the perfectly ordinary suburban street on which it sits, it’s little more than a white cube rising from a black rectangle. Here's another charred-cedar facade, this on in Japan by architect Terunobu Fujimori. Read more on his technique here. Fujimoto's work was the inspiration for architect Peter Weijnen's green house in Amsterdam. A coat of black paint modernizes the facade of a 1907 villa renovation in Hamburg, Germany. A San Francisco house that survived the Great Quake and the intervening decades is reborn after a serious intervention by modernist architect David Baker. Juliet Gray, Mathias Kolehmainen, and their sons Cooper and Cyrus have a new favorite hangout: the wide back steps on the addition to their Louisville, Kentucky, house, which double as theater seating. Out of respect for the structure's more traditional neighbors, architect Roberto de Leon painted the exterior of the addition Black Forest Green, a Benjamin Moore hue commonly used on plantation shutters in the South. The black facade of the Yatabe family’s house may turn a darkly futuristic face to its suburban block, but behind it the house is full of light. In Saitama, a tightly packed neighborhood near Tokyo, the black metal screen affords the family privacy without sacrificing outdoor space. Architect David Adjaye selected a dark-brown stained facade for the moden house he designed for photographer Ed Reed in London. The Sunken House, so-named for its excavated site, is a dark, cedar-clad cube in a stuffy part of town, where weathered brick and clay chimney pots are more common than modernist angles. While still studying architecture at Eindhoven University, Servie Boetzkes and Jeroen Helder landed a commission through “friends of friends” to build a home in a suburb of Arnhem, the Netherlands, clad in dark aluminum. Thought the facade of this Sydney, Australia, house is painted black, the rear is open and airy. A dramatic departure from your typical cabin on the lake, this unique retreat adds shades of black to a tiny island awash with local color. Photo by Daniel Hennessy. Image courtesy of ©2010 DANIEL HENNESSY PHOTOGRAPHY.